It is a question that you hear time and time again among homeowners and industry professionals alike: what is the best fuel source when it comes to heating your Columbus home? The fact of the matter is that there is no definitive answer. Working with a professional heating technician at Quality Air Heating and Air Conditioning and educating yourself about the pros and cons of the different heating fuels will help you discover the best fuel source for your particular needs and home heating habits, though. Take a few moments to review some of the pros and cons of each fuel source before deciding which is the best way to heat your home. Electricity is a very common home heating fuel choice as it is the most readily available option. While natural gas service is contingent on piping systems and access to a main gas line, most homes have access to electrical service. Electricity has the most expensive purchasing price of these fuel choices, but that does not mean that it is the most expensive to operate necessarily. A high-efficiency electric furnace, for instance, can outperform a less efficient gas one, as the more expensive fuel source is more efficiently utilized. Of course heating your home does leave you vulnerable to power outages, though a backup generator can help with that. Possibly the most popular heating choice at the moment is natural gas. Natural gas is a largely domestic product and is very clean burning. Gas furnaces are very efficient and provide comfortable, even heating and natural gas can also be used for cooking and even drying your clothes. There is the possibility for safety concerns such as natural gas leaks or carbon monoxide exposure, but with proper maintenance and a professional installation it is generally a very safe fuel. Access to natural gas is not necessarily available everywhere, though, and if your home does not have the necessary pipe system it may make more sense to opt for a different fuel source. 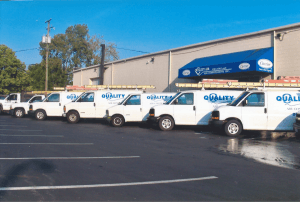 There is a lot to consider when choosing a home heating fuel, so feel free to ask a professional Columbus heating technician at Quality Air Heating and Air Conditioning for advice. We’ll help make sure that you make the best choice for your home heating needs in Columbus.